Our sermon today is a lecture given by Alistair Begg at this year’s Shepherds’ Conference (2015). The mission of the Shepherds’ Conference is to provide the opportunity for men in church leadership to be challenged in their commitment to biblical ministry and to find encouragement as together we seek to become more effective servants of our chief Shepherd. 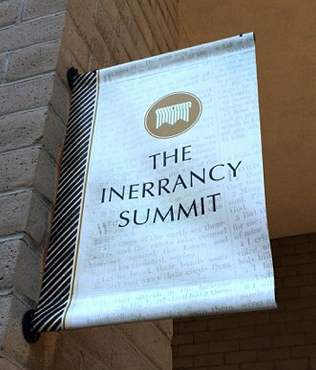 Visit the inerrantword.com website for more information on this year’s topic. A great many learned men are defending the Gospel—no doubt it is a very proper and right thing to do—yet I always notice that when there are most books of that kind, it is because the Gospel, itself, is not being preached. Suppose a number of persons were to take it into their heads that they had to defend a lion, a full-grown king of beasts! There he is in a cage and here come all the soldiers of the army to fight for him. Well, I would suggest to them, if they would not object and feel that it was humbling to them, that they should kindly stand back, open the door, and let the lion out! I believe that would be the best way of defending him, for he would take care of himself—and the best “apology” for the Gospel is to let the Gospel out! Never mind about defending Deuteronomy or the whole of the Pentateuch—preach Jesus Christ and Him crucified! Let the Lion out and see who will dare to approach Him!The Lion of the tribe of Judah will soon drive away all His adversaries! With Easter Sunday being this weekend, pray for your pastors, elders, and deacons. They are no-doubt under a lot of pressure to get everything just right for one of the biggest Sunday’s of the year. A day that statistics have shown time and time again that many who are not saved will attend a Sunday Morning service. The temptation to defend the Gospel by appealing to the desires or comfort of the once-in-a-year attendee is strong. Pray that rather than succumb to the pressure of defending the Gospel by keeping it caged up, your pastors might instead open the cage and Let the Lion Out!